Coming up with the perfect recipe for Vegan Mole Enchiladas has been at the top of my to do list for ages! I am obsessed with mole sauce and there are not a lot of vegan options, even here in Los Angeles. I am within walking distance of at least fifteen Mexican restaurants and not a single one offers a vegan option. Luckily, I am always up for a culinary challenge if it involves vegan Mexican food, so here we go! There are many sauce components to this dish, all adding to the complex, creamy flavor that mole enchiladas are famous for. If you have all of the ingredients ready and develop a nice flow in the kitchen, you can make these easily in an afternoon. Making the cashew cream ahead of time will cut down on the meal prep, plus cashew cream is delicious and handy to have in the fridge. It adds a little something special to just about any vegan savory dish. The mole, cashew cream, and cilantro avocado sauce together is some next level goodness that will make you want to eat these every day! I literally ate these enchiladas for three days straight when I made them the first time. Combine all ingredients for the Mexican Rice in a large rice cooker, press start. Prepare your vegan mole sauce if you can’t find a good store bought brand. Recipe and instructions below. Heat a large skillet on medium high heat. Melt 2 tablespoons coconut oil, then add the sweet potato. Cook for 2-3 minutes, then add the onion and garlic. Keep cooking for another 5 or so minutes, stirring often. Melt one more tablespoon of coconut oil into the pan, then add the crumbled tofu and spices. Keep stirring and cooking for 2-3 minutes, then add the orange pepper, green chilis, and diced tomatoes. Preheat the oven to 375 degrees. Let the veggies cook for another 10 minutes, stirring every so often. In the meantime, prepare the cashew cream. On to assembly! Grease an oven safe casserole dish with coconut oil. Spread 1-2 tablespoons of refried black beans on a corn tortilla. Add 1/2 cup of the veggie mixture and a dollop of cashew cream, then roll it up tightly. Place the enchilada seam side down on the pan, then keep assembling enchiladas until the pan is full. Don’t squish too many into the pan, or they won’t soak up as much sauce. This recipe makes enough for two pans of enchiladas, or you can save the leftover veggies and rice for a different meal. Cover the top of the enchiladas with 1 cup of vegan mole sauce. Bake for ten minutes at 375 degrees. While your tasty vegan mole enchiladas are baking, make the cilantro avocado sauce and get excited. It’s almost time to eat! 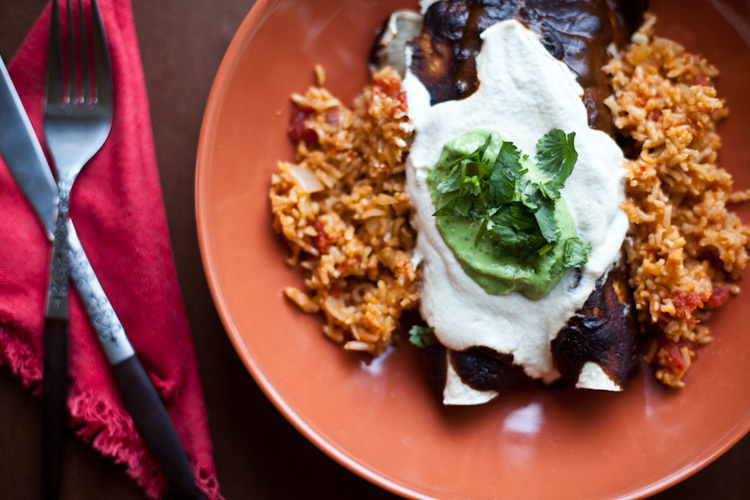 Serve two or three enchiladas in the middle of a plate, with big spoonfuls of Mexican Rice on either side. Top with cashew cream, cilantro avocado sauce, and a bit of fresh cilantro. Mole Sauce- Heat the coconut oil in large stockpot over medium heat. Add the onions and cook about 12 minutes, or until lightly browned. Add the garlic, chili powder, brown sugar, cinnamon, chipotle chili powder, and ground cloves and cook about 1 minute more, or until fragrant, stirring constantly. Add the tomatoes, cocoa powder, peanut butter and vegetable broth. Reduce heat to medium-low and simmer for 15 minutes, stirring occasionally. Allow to cool slightly and then puree with an immersion blender or transfer to a blender and blend until smooth. Set aside. Cashew Cream Sauce- Combine the cashews, lemon juice and salt in a food processor. Mix for 2 minutes. Stop to scrape down the sides, then mix for another 1-2 minutes. Add the water slowly as the cashew cream is mixing. Pour the cream into a different container, then clean your food processor for the cilantro avocado sauce. Cilantro Avocado Sauce- Deseed the avocados, then scoop the flesh into the food processor. Add the cilantro, lime or lemon, and sea salt. Process for 1-2 minutes. Scrape down the sides, the mix for another 1-2 minutes. Add the filtered water slowly as the sauce is processing. We love to connect with you! Say hi to us on Facebook, Pinterest, Instagram, and Twitter. A beautiful presentation, Megan. This recipe looks delicious! When you’re cooking the rice in the rice cooker do you push the brown rice setting? Also I just wanted to make sure that the mole recipe calls for a 1/4 cup of chili powder and that it wasn’t a typo ? 1/4 cup of chili is correct, the recipe makes quite a bit of sauce! Also, my rice cooker only has one setting but I would use the brown rice setting if you are cooking brown rice. Enjoy the recipe!